This weeks photo of the week comes to you from the landscape photographers heaven, Iceland. This is one of my photographs of Dettifoss, a waterfall in Vatnajökull National Park in Northeast Iceland. Detifoss is reputed to be the most powerful waterfall in Europe. I spent 2 weeks road-tripping around Iceland with my buddy Anj Semark and another friend, Dan. We had camped nearby and set our alarms the night before for sunrise. Stepping out of the warmth of the sleeping bag when the alarm buzzed, I realized it was one of the coldest mornings I have experienced in my lifetime! There was snow covering certain sections of the path on the way to the falls, and there was a fair bit of wind chill. The thermostat in the car was telling me it was 3ºC. However, we hadn’t woken up at this hour for nothing. We made the short drive to the parking lot at Detifoss and unpacked our gear for the hike in (only a few hundred metres). We could hear the roar of the falls from quite a distance. We were the only 3 photographers there besides one man who turned up just as we were leaving. The photograph I chose this week was one of the first I shot on that morning from further away from the falls. Once you got closer to the falls it was incredibly loud and you were shrouded in the mist being whipped around by the wind. 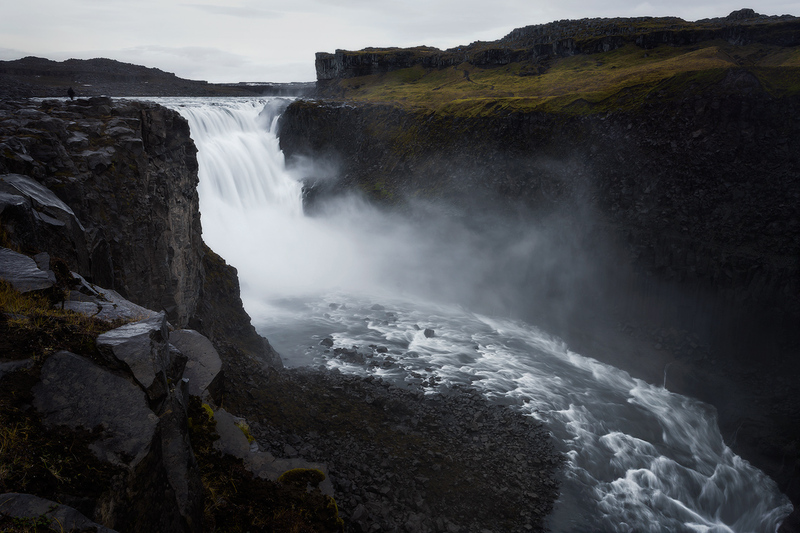 I managed to get a few photos from closer up, including a panoramic one which I will release at a later date, but I enjoy this one which, in my opinion, sums up our morning at Dettifoss. Notice Andrew standing further up the ridge for a sense of scale to the shot.